By Steven Black, part two of a series of three technical blogs that focus on Windows 10. Microsoft added the SCCM servicing feature for Windows 10 to manage Windows 10 upgrades. Using the feature in production environments has raised a few issues with its deployment method and the inconsistent scheduling of Windows 10 upgrades. This article presents an alternative method of deploying upgrades that put you in control of scheduling and the production configuration of the upgraded Windows 10 operating system. Windows 10 upgrades will, apparently, be made available twice a year. 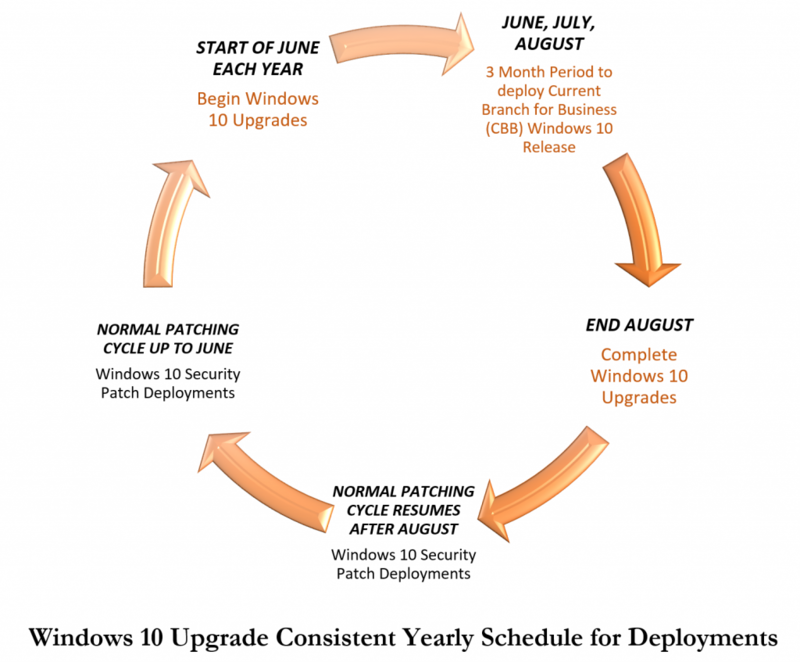 The exact month each upgrade is available are likely to vary from year to year if Windows 10 releases to date are indicators of what is to come. This leaves you largely at the mercy of Microsoft in planning update cycles for Windows 10. When Windows 10 upgrades are available and deployed directly from media or using the Windows 10 servicing feature in SCCM, the resulting upgraded operating system may have re-installed many of the modern Windows applications you may have previously removed. Both of these scenarios are far from ideal, requiring business buy-in, communications, and flexibility throughout the year as well as re-working of upgraded operating systems to remove what was re-installed. The alternative model we propose will allow you to control both the schedule and the final configuration of the upgrade when it is complete. It comprises two distinct parts – scheduling and deployment. Microsoft plan release two Windows 10 upgrades per year, each upwards of 3GB in size, with deployment times of between 45 minutes on SSD equipped devices to over 2 hours on older devices. If your estate has upwards of a few hundred devices this is a significant workload to add to what you already do. The upgrade releases presently have no set monthly release schedules. Asking the business to tolerate this could be a difficult task, as proving business value for each upgrade means re-evaluating afresh the features of each upgrade package. An alternative approach is to set a schedule to deploy whatever version of Windows 10 is available in a consistent period each year. 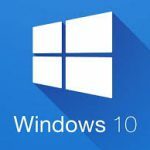 For example, if you select between beginning of June and end of August as the period and Windows 10 1703 is the latest version available then you deploy 1703 to your estate. Once deployed, you wait until the same period next year to do the same, but with the newer Current Branch for Business release version of Windows 10 available at that time. The reasons for suggesting this approach are threefold. Firstly, the upgrade is a huge undertaking that requires considerable planning, communication, scheduling, and support. To do this twice a year is unrealistic in resource terms in many organisations. Secondly, the business impact of the upgrade is significant: network downloads to each workstation of over 3GB, users having to logout for an hour or more, and the service desk typically dealing with increased support calls following the upgrade. Repeating this twice a year is an enormous task. Lastly, Microsoft are not committing to set months for releases of Windows 10 upgrades. Consider the first two reasons and factor in the randomness of when they might occur and you have a highly undesirable situation that you probably want to avoid – twice a year. Our suggested approach is in the diagram below. It is part of a yearly operate and maintain cycle for a Windows desktop operating environment. When the Windows 10 upgrades are complete, normal security patching services will resume. All of this is possible through SCCM. Ideally, the deployment of Windows 10 upgrades should be via an SCCM task sequence. This puts you in control of the upgrade’s delivery and configuration. In contrast, Windows 10 Servicing in SCCM is similar to WSUS – it will deliver the upgraded operating system as it comes – out of the box. Any customisations you have made to the existing build following the upgrade could be lost, and any applications you may want to remove or upgrade will remain as is. Our approach upgrades Windows 10 using an SCCM task sequence. This allows you to uninstall applications prior to the upgrade, deliver the upgrade, and then customise the build by, for example, removing modern Windows applications, upgrading existing applications or installing new ones. Adding these and other customisations to the task sequence improves management and control of the build and the user experience. Creating a task sequence for upgrading Windows 10 is something we have successfully carried out for many customers to date. You can use this for future Windows 10 upgrades to deliver a reliable and repeatable upgrade experience….once a year!